Kistler et al. 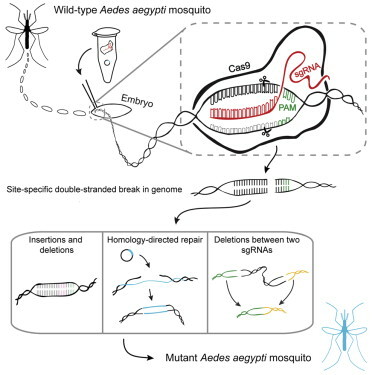 have just published the results of their extensive use of CRISPR/Cas9-based knock-out and knock-in technology in Aedes aegypti in Cell Reports and anyone considering using these technologies in insects will find this paper of interest. The authors compare embryo-microinjection mixes with varying concentrations of Cas9 and sgRNAs and find that transient expression of Cas9 from plasmids was least effective (no detectable rate of mutagenesis), mRNA was somewhat effective and purified Cas9 protein was highly effective in generating mutations in the presence of sgRNA. Varying the concentration of Cas9 protein, they saw measurable differences in mutagenesis rates and affects on embryo viability, with high concentrations seemingly reducing embryo viability. For Aedes aegypti they recommend 300ng/ul Cas9 protein, 40ng/ul sgRNA(each), 200ng/ul ssODN or 500ng/ul double-stranded plasmid DNA for knock-ins. This would be a good starting point for others working on insects other than Aedes aegypti. Data from Kistler et al. showing the relative effectiveness of purified Cas9 protein compared to Cas9 mRNA when included in an injection mix containing sgRNAs. Cas9 protein consistently results in higher rates of mutagenesis. Purified Cas9 is available commercially. They also measure the somatic mutagenesis rates using optimized Cas9 protein concentrations and various sgRNAs targeting six different genes- three sgRNAs each. Not surprisingly they see significant variance in mutgenesis rates as function of the sgRNAs although all of their sgRNAs resulted in measurable rates of mutagenesis. Interestingly they found a genomic target that was resistant to mutagenesis with six different sgRNAs. They recommend designing and testing multiple sgRNAs before investing heavily in time and effort to generate germline modifications. Good advice that echoes that of others. The authors describe their successful effort to create large deletions by using multiple sgRNAs and kocking-in a short sequence to insert premature stop signals within the native coding region of the target gene. In both cases, their efforts were successful. Finally, they describe their efforts to knock-in a large transgene (a constitutively expressed fluorescent-protein gene) on a plasmid. They successfully inserted this transgene into two of the four loci they targeted. 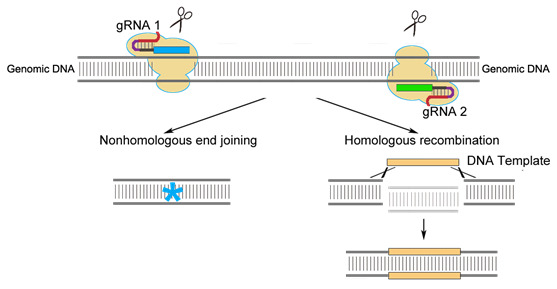 Knock-in frequencies using homology directed repair and a plasmid-based donor tends to be more challenging and less efficient than simple knock-out mutagenesis or knocking-in short sequences using single stranded donors. Two outcomes from CRISPR/Cas9 mutagenesis. Image from BestGene. Kistler et al. provide a lot of very useful information and perhaps more importantly they provide, as a Supplement, a step-by-step manual describing the design process and steps for generating and testing various reagents. We have succesfully road-tested their manual and think it will be broadly useful to insect biologists. Kistler et al.’s detailed procedures. Kistler, K. E., Vosshall, L. B., Matthews, B. J., Genome Engineering with CRISPR-Cas9 in the Mosquito Aedes aegypti. Cell Reports 11: 51-60doi: 10.1016/j.celrep.2015.03.009.